Turkish protestors and riot policemen continue to clash in central Istanbul, leading Turkish stock markets to erase all their gains for the year. For years, investing in Turkey was a one-way bet. But since protests and unrest broke out in central Istanbul at the end of May, Turkish markets have taken a turn for the worse. Liquidity has dried up and the benchmark index -- the Istanbul Stock Exchange National 100 Index -- completely wiped out its year-to-date gains Tuesday. 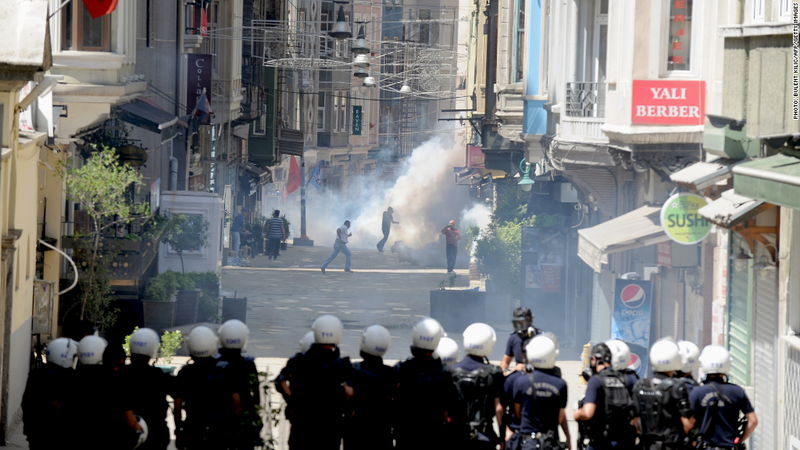 Central Istanbul saw more violence as riot police moved in on protesters and fired tear gas and water cannons. Protesters responded by lobbing Molotov cocktails at armored vehicles. "Investors are falling out of love very quickly with Turkey," said London-based market strategist Ishaq Siddiqi from ETX Capital. Siddiqi says it's not just the unrest and violence that has caused investors to flee, it's also the threat of the U.S. Federal Reserve pulling back on its bond-buying program. "Emerging markets such as Turkey have been big beneficiaries of easy Fed money so a reduction of that will further dent capital inflows into Turkey," he wrote in a report. Siddiqi expects investors will start pulling their money out of all emerging markets, including Turkey, and start putting more to work in developed markets, especially as the U.S. recovery continues and Europe emerges from recession. Yields on Turkey's short-term government bonds shot higher and the lira continued to weaken versus the U.S. dollar and the euro. The Turkish central bank responded Tuesday to the volatility by tightening monetary policy to encourage financial stability and shore up the lira. But not all investors are running scared, yet. Fund manager Tim Steinle from boutique investment firm U.S. Global Investors says he is still buying into Turkish companies in his Emerging Europe fund, snapping up some consumer names and automakers. Steinle points out that extreme volatility is not unusual in Turkish markets and he's confident stocks will bounce back. Disparate groups have united across the country to accuse the government of authoritarianism. Meanwhile, Prime Minister Recep Tayyip Erdogan has criticized anti-government protesters and accused speculators of trying to profit from the unrest. Erdogan remains popular with many Turks because of his economic record over the past 10 years. Unemployment has been falling and Turkey has surged up global rankings for competitiveness, attracting a growing number of multinational companies to Istanbul. Gross domestic product growth has averaged 5% over Erdogan's time in office, and his government has been credited with pursuing prudent fiscal and monetary policies while promoting investments in infrastructure, education, health and technology. But the country relies heavily on foreign investors and tourism to finance its trade deficit and a sudden outflow of funds could derail the economy. --CNN's Nick Paton Walsh, Gul Tuysuz and Ben Brumfield contributed to this story.